Music lessons will ring loud and clear in the classroom with the help of BestRite's graphic music boards. With bold black music lines, these graphic boards make it easy to display large musical notation for a whole room to read. The everlasting lines are embedded permanently into the board surface, so they won't fade with use. Notes, scales and chords can be written with erasable marker pens, and simply wiped away when it's time for the next lesson. 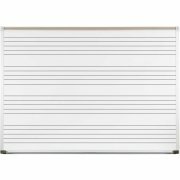 A superior porcelain surface coats the music boards, and the steel substrate makes them magnetic for your convenience. Music boards are available in three different sizes. Made in the USA. 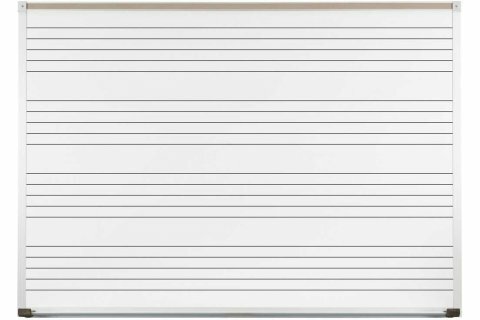 Clear graphics: Bold, black lines embedded into the surface of the board make musical notation stand out and easy to see. Each board has 5 staves, 5 inches apart, with a 4-inch boarder above and below the first and last staff. The lines in each staff are 1-inch apart. Quality: Superior porcelain-on-steel surface with aluminum frame. Wood frame is also available - call 888-793-4999 for details. Easy maintenance: Write with erasable marker pens and wipe clean with cloth, tissue or chalkboard eraser. Any ink residue that remains can be rubbed off with spray-on glass cleaner. Functional: Boards come equipped with a full-length marker tray and a map rail.